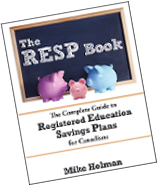 First off – I’m proud to say that Rob Carrick of the Globe and Mail mentioned my RESP book in his newsletter today – thanks a lot Rob! Earlier today, I reviewed the very good retirement planning book, Pensionize Your Nest Egg. One of the authors – Alexandra Macqueen was kind enough to offer a copy to give away to a lucky reader. This one is simple – leave a comment explaining why you are interested in the book. The winner will be chosen randomly from all eligible entries. Thursday, October 7 at 8 pm. Winners will be announced Thursday night or on Friday morning (depending on how good the Leafs/Habs game is).